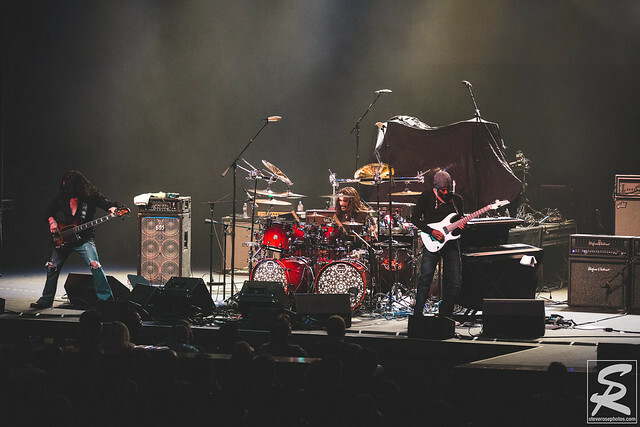 The Fox Performing Arts Center was the first stop on Steve Vai’s 25th Anniversary Passion and Warfare Tour and those in attendance were treated to a masterful performance from the legendary guitarist. Fellow “brother in shred” and former bandmate, Tony MacAlpine, delivered a great and emotional performance to open the show. His set showcased his technical prowess and it was great to see him perform after missing some time while recovering from colon cancer. 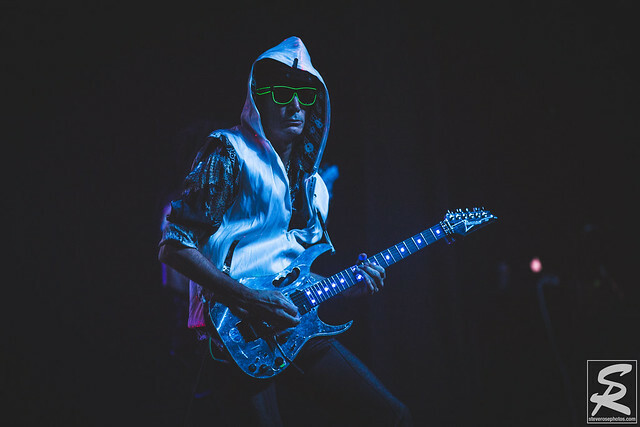 The crowd got fired up when Steve Vai took the stage and opened with “Bad Horsie” on his mirrored Ibanez Jem with light up guitar inlays. Vai, ever the showman, was phenomenal all evening as he coaxed notes out of his guitar and wowed the crowd with his fireworks along the fretboard. As this was the celebration of the release of Passion and Warfare 25 years ago, Vai played the entire album for the first time — something he said he had wanted to do for a long time and just need the right band to pull it off. That band consists of long time members: Dave Weiner on guitar, Jeremy Colson on drums, and Philip Bynoe on bass, and were totally awesome as the helped pull of this classic material. Throughout the night, Vai played a number of songs along with video accompaniment. Highlights included Vai playing “Liberty” along with a video of himself and Brian May playing the song from a 1991 performance in Spain, and Joe Satriani playing along and trading solos with Steve during “The Riddle.” It was special to see MacAlpine along with bass superstar, Billy Sheehan, join Vai for the encore. The highlight of the evening was watching him play “For the Love of God.” That is such a powerful song and benchmark for all aspiring guitarists — I won’t be surprised if it’s the highlight of every show on this tour! This tour runs through the middle of December and you won’t want to miss the opportunity to see these amazing musicians perform Passion and Warfare in its entirety. Killswitch Engage Dominates Downtown L.A.